Stainless steel kennel are used to house small animal patients during their stay. The kennels are cleaned and disinfected between each patient to prevent disease transmission. Patients can relax and enjoy their stay as this room is separate from the hustle and bustle of the rest of the clinic. Covered outdoor runs are used for outdoor time (weather permitting) . These run are completely enclosed and not accessible from the outside to prevent release of an animal. All runs are disinfected to prevent disease transmission. Our exam room was designed to allow ample space for pets and their owners to be comfortable during their visit. No matter where your pet is more comfortable the floor; the exam table; or on the bench seating with you; comfort and low stress is our goal. We proudly practice fear free principals to help make the visit pleasant and safe for both the animal and the client. With each annual vaccination a yearly exam is done providing preventative care that can extend your pets life. Physical, ophthalmic and neurological exams as well as minor procedures or treatments take place in the exam room. Our surgery room is outfitted with some of the latest equipment for anesthetic monitoring and excellent surgical lighting. We also use a gas anesthesia machine using isoflurane, one of the leading inhalant anesthetics for veterinary medicine. We also have a “wet table” which is used for dentals and other procedures that require fluid drainage. Many other instruments are in place to allow for care of your animal. We have things like a liquid nitrogen instrument that allows us to freeze a mass if it is determined that cryo surgery is the best option. This unit is used frequently in both the small and large animal side of the clinic. Automatic autoclave is used after each surgical procedure to sterilize instruments. 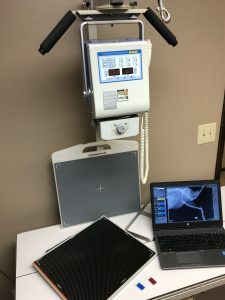 One of the most frequently used and convenient pieces of equipment we have to offer is digital radiography or a “DR x-ray” unit. This allows images of both small an large animals to be taken and viewed within seconds.